If your 2017 New Year’s resolution is to buy a home, Realtor.com®’s #1 recommendation is to start the process early in the year. Their reasoning is this: after comparing the number of listings to the number of home buyers, they found that buyers who start their search in January or February face less competition with nearly the same number of homes. 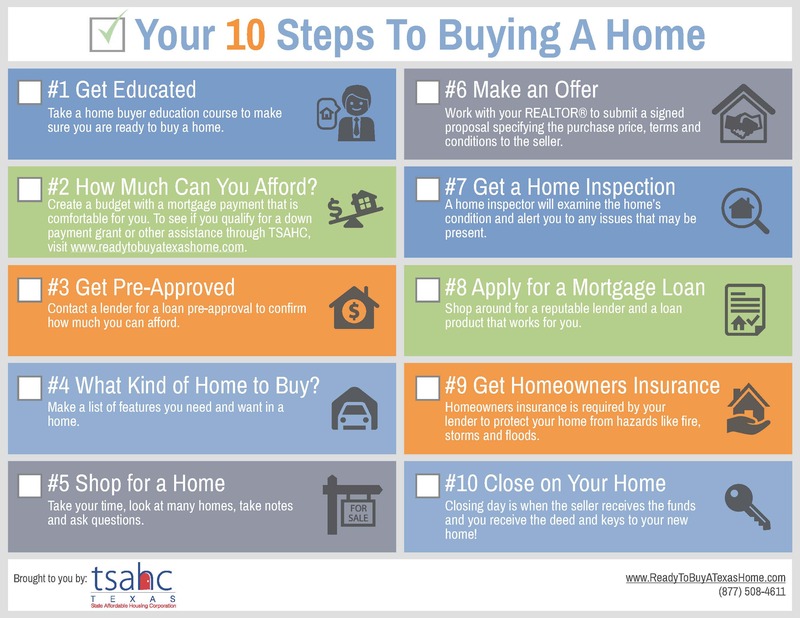 Buying a home can be a very complicated process, so TSAHC has created a checklist to help you determine if you are ready to buy a home. By following this checklist, you can be prepared to act when the perfect home comes along. Step 1: Get Educated. Take a home buyer education course to make sure you are ready to buy a home. Visit the Texas Financial Toolbox to find a quality home buyer education course in your area. Step 2: How Much Can You Afford? Create a budget with a mortgage payment that is comfortable for you. To see if you qualify for a down payment grant or other assistance through TSAHC, visit www.readytobuyatexashome.com. Step 3: Get Pre-Approved. Contact a lender for a loan pre-approval to confirm how much you can afford. Step 4: What Kind of Home to Buy? Make a list of features you need and want in a home. Step 5: Shop for a Home. Take your time, look at many homes, take notes and ask questions. Step 6: Make an Offer. Work with your REALTOR® to submit a signed proposal specifying the purchase price, terms and conditions to the seller. Step 7: Get a Home Inspection. A home inspector will examine the home’s condition and alert you to any issues that may be present. Step 8: Apply for a Mortgage Loan. Shop around for a reputable lender and a loan product that works for you. Step 9: Get Homeowners Insurance. Homeowners insurance is required by your lender to protect your home from hazards like fire, storms and floods. Step 10: Close on Your Home. Closing day is when the seller receives the funds and you receive the deed and keys to your new home! Click here to read about each of these steps in detail. We also encourage you to check out our Texas Mortgage Calculator to estimate your mortgage interest rate based on your FICO score.